SENSEI STAN SCHMIDT. Interview By Seamus O'Dowd & Garry Cashman. KI UNDO, KIKO, QIGONG: ENERGETICS IN KARATE. By Bob Remington. KUMITE TRAINING DRILLS (PART 4)	By Bryce Fleming. KARATE SCIENCE: FACT OR FICTION. By Clint Whittaker Cooper. WRIST LOCK RELEASES IN SHOTOKAN KATA. By Gregory Jeffers. BELT WRAPPING. By Lindle Beets. ALAN CAMPBELL: GRADING FOR 6th DAN IN JAPAN. By Simon Bligh. I've said this before but I think it's very true, that the name 'LEGEND' is banded about a bit too easily these days and many times it's not deserved. 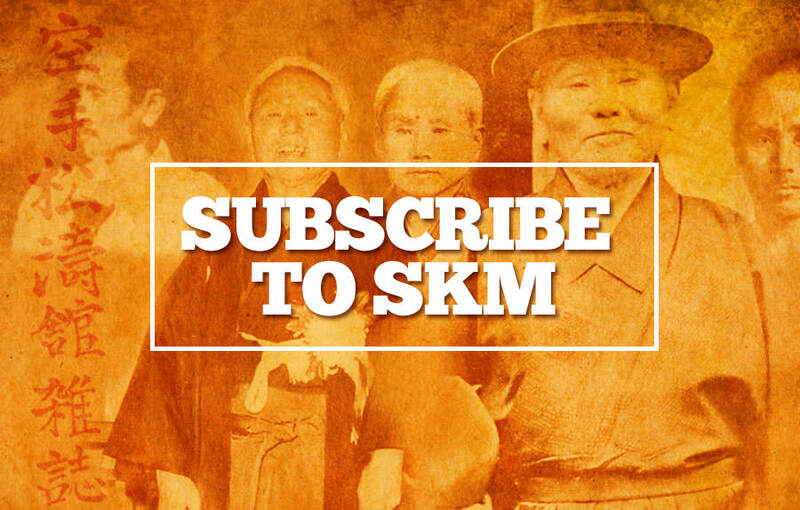 However, featured in this edition is one man who the whole Shotokan world feels justly deserves this title, and that man is Sensei Stan Schmidt. 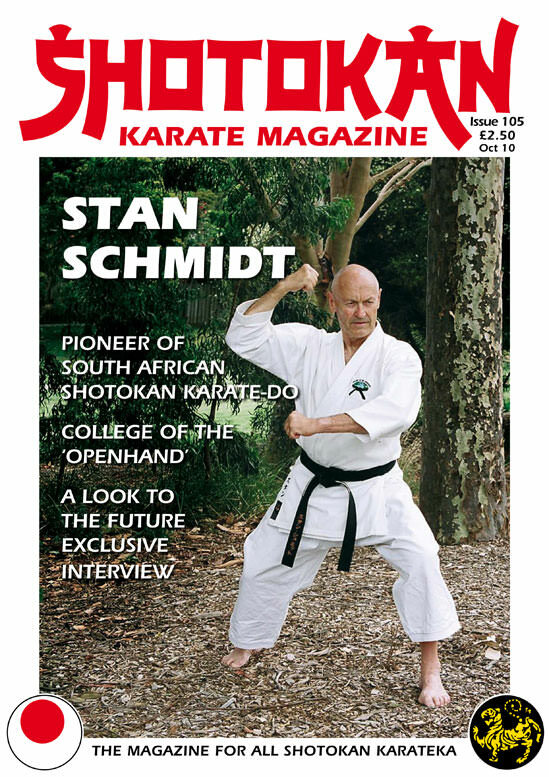 It's a long time since we had an interview with Stan Schmidt and after a lifetime in karate-do it is fascinating to read his views and ideas about the future of karate and his own personal goal to develop in his now adopted country, Australia, what he calls, 'College of The OPENHAND'. I want to thank Seamus O'Dowd and Garry Cashman for this exclusive interview. Stan Schmidt has now relocated to live in Australia with his whole family and he tells me that he is very, very happy there and has a dojo where he continues to practice and teach karate which he began studying in his native South Africa in the late 1950's. Stan Schmidt is 73 years old and after almost sixty years of martial arts training experience his words are indeed words of wisdom. The man is an inspiration to karateka young and old to continue training but to use your head and adjust the training to suit your own body and personality, especially as one gets older. After two hip-replacements, sensei Stan now say's that there are certain techniques that he definitely does not practice, one is yoko geri ke-age (side snap kick) and although of course he practices gyaku zuki (reverse punch) nowadays he never uses a long stance (zenkutsu dachi) as practiced in many Shotokan dojos both Western and Japanese even today. Interestingly I have noticed that many Shotokan practitioners have shortened their zenkutsu dachi, especially karateka over the age of fifty, I personally have changed that aspect drastically. Also, to my mind it's pointless and possibly detrimental to one's joints to do high repetition techniques in fresh-air once past the age of about 50. This is just my opinion but I prefer to do all basic techniques (kicks-punches-strikes) whilst impact training on pads, at varying levels of power – and work on lots of partner drills for distance and timing, and 'try' and make kata more fluent, relaxed and softer. I've looked at a lot of older instructors and many of them (not all of course) carry severe injuries from over-training in high-repetition techniques in 'fresh air'. Surely the idea of 'karate for life' means protecting (self-defense) one's own health, it seems logical to me! Of course I must mention also the second interview in this edition with British karateka Alan Campbell who describes in graphic detail his quite daunting experience of taking the physical grading examination for rokudan (6th Dan) at the Hombu dojo of the JKS (Japan Karate Shotorenmei) in Tokyo under the watchful eye of JKS Technical Director, sensei Masao Kagawa 8th Dan. This is quite rare these days as most Shotokan organisations do not require a 'physical' examination for 6th Dan. Good health, good training, Editor. Alan Campbell, based in Nottingham U.K. (Photo's By Michael Fahlsten). Q: You have recently returned from Japan, where you tested for 6th Dan. Why did you go? A: Because I'm mad! (Laughs). No, I went because I needed to challenge myself, which was the most important thing. I'd passed my 5th Dan with Asai Sensei and that was an extremely special experience and became more so with his passing away. (At this point my attention was drawn to Alan's 5th Dan certificate, which hangs on his wall at home. It is a beautiful hand written work of art in Asai Sensei's own hand, quite unlike the standard JKS (or any other for that matter) Dan grade certificate. Asai Sensei issued these hand written certificates on special paper to those people who passed 5th Dan and above. Q: So you went to Japan in December 2009, how did it come to be that you decided to go and what was your preparation like for the test? A: Well I was with Kagawa Sensei on a course in March of 2009 and we were talking about gradings and how I was due one at the end of the year. He suggested I could take it at the JKS European Championships in Israel November 2010, which he knew I would be attending with the England Team. I felt this was too far ahead for me as I'd set it in my head to do it and was really looking for about a six to eight month lead up for it, I said "That's ok but isn't there anywhere I could do it a little sooner, and, straight away his energy levels went up and said, "Oh well there is a grading at the Honbu dojo in Tokyo in December you could do it then!" Of course I said yes and that was the moment when everything started. Q: Do you feel that grading on a course in the UK would have been more of a formality or somehow less of a challenge? A: Yes I do really, I've been around the Japanese long enough to know that what you experience with them here in the UK is not the same as when they are on their home territory (Japan) I knew I wanted to be put under the most pressure possible, for it to be taken out of my hands almost, I wanted to have a fight on my hands! From the moment it was decided I intensified my training. I continued my usual morning training but added an extra couple to allow for more tube training to build up my fitness level and in the dojo at night I stood in the line and let my other instructors take the class. I did a lot of kata with applications as the syllabus for rokudan seemed to focus heavily on this aspect. Q: Would you say that a big part of your preparation was looking into yourself as a solo training experience? A: Yes, the thing for me with 6th Dan was that I felt it wasn't something that anyone could help me with in that it's so far removed from anything that most people experience, at that level it's a journey that only I could take, because it was so personal to me, I felt I needed to go on my own. When we go to Japan it's normally as a large group, for kangeiko (cold season training) or tournaments etc, but for this I really didn't want to go in a group. So also the way I trained was all about just me and how I felt about me. At this stage in my life I wanted to see what I had left. The Budo spirit that I've always known Karate for, the very Budo I try to instill in my students. Did I still have it? I needed to push myself to find out! Q: So, you up your training, the months go by. You book your flight, fly to Tokyo and walk into the Honbu dojo. What was it like? A: Well the grading was originally scheduled for the Saturday and I had booked my flight accordingly, so arriving on the Wednesday and having a few days to train at the headquarters to get tuned in! Then several weeks before I was due to go I got an email asking me if I'd be ok with it being brought forward to 12 noon on the Friday! (High Noon, how appropriate I thought!) So my preparation/acclimatisation time there was cut down a little but really I was quite pleased because it forced me in to that feeling of "let's get on with it" I still had some sessions on the Thursday and Friday morning to do. These were the famous JKS Honbu dojo full on no holds barred sessions that we've come to know and love! I did the Thursday evening class with Kagawa Sensei and as with all the headquarter instructors Kagawa Sensei trains with you, full on, often right beside you shoulder to shoulder. That puts a rocket up you! It's not a massive dojo so there's nowhere to hide, there are mirrors all along the wall so Kagawa Sensei can see you, from anywhere and of course you can see yourself and that's sometimes challenging in itself! Sometimes the mirrors steam up so maybe that's a tiny hiding place (laugh). The training is kihon, gut wrenching hard kihon. Then kumite. Drill work and Jiyu kumite, partnering everyone, regular students and instructors. And there are a lot of good regular students. I was partnered some of the time with an ex Teikyo University student who was very sharp, very strong but also very fair, a pleasure to partner. Alan fought three different opponents. Q: So can you take us through to the day of the grading? A: Well I felt I'd done really well up to the last third of the second session on the Thursday, we'd finished on Kata and Kagawa Sensei had taken my kata (Nijushiho) apart, in a constructive way mostly! But I'd taken a bit of a dip because of that. So Friday morning was a bit daunting. I was sort of on edge, because I hadn't expected my choice kata to be ripped apart. Then I also felt angry with myself because some of his points were valid and I just didn't feel I had enough time to rectify them. We were staying in Ikebukoro, a ten minute train ride from Sugamo, where the headquarters are. On Friday morning those ten minutes felt a lot longer on that normally short journey. Up to then I had been quite upbeat but now Wendy (my partner who was in Japan for the first time) knew not to talk to me! Q: So you knew this wasn't a formality? You weren't just showing your face at the Headquarters? A: No not at all. I certainly wasn't looking to be awarded something. I was looking to pass something I feel there's a difference! I wanted the test. I felt this might be my last big challenge in Karate, at least in the foreseeable future. Any reputable Karate organisation has to have a physical test for 6th Dan and for the last time kumite. That was the challenge I wanted, 6th Dan in Japan. And I know it's different in Japan! The sensei we see in Europe and America are different in Japan, on their home turf, anyone who has trained properly in Japan will tell you that. I don't mean people who have gone for a holiday and done a bit of training. I mean train everyday, morning and evening solid, consistently. They know we get a watered down version over here because the Japanese mindset is so different from ours. When they come to us they change their mentality, we don't change ours. But when they are in their home territory they just do what they do. They just get on with it, without compromise. When they come here they are more open minded and much nicer! But when you go there it's much more brutal. And it's like that everyday. The JKS Honbu is full of instructors who train. There is no massaging of egos, it's about putting the work in and it's not acceptable to go through the motions. Anyone who thinks training in Japan is not hard or as hard as it used to be is deluded or maybe they have been to the wrong dojo. Q: So it's twelve o'clock and the grading begins? A: Well not quite twelve o'clock because we (typically), have, first a killer session with Kanayama Sensei. He trains along too. He has very clean pure technique, a great technician. Lots of slow kicking, in that session! In a class like that you get so involved that you kind of forget you have a grading next. This was good because I'd tried to compartmentalise the whole trip. You know, "Let me just eat my breakfast and get to the station. Let me just get on the train. Let me just get to the dojo." Every single thing was just get that bit over with. So the class with Kanayama was great because it was an hour of pure concentration and not worrying about the grading. Also, it was crucial to train hard and give out the signals to Kenshusei and Junior Instructors, like a pack of wolves in the corner! Q: Was it just you grading? A: No, it was a senior grading. The date had been moved forward because the Saturday was a general Honbu dojo grading. Friday saw three of us grade, one for yondan, one for godan and me. These guys were from Venezuela and the USA. All the Honbu instructors were there and I was feeling ready, you know ready to go to work, just waiting for the first name to be called. The others went first, and then I was called for kata. Q: There's no kihon for 6th Dan? A: No, if you can't do kihon by now there's no point taking 6th Dan, I was led towards the belief that actually I would do only kata with demonstrated applications then submit my kumite report. Of course I didn't really believe that there would be no kumite (just hoped!). Q: You had your report translated into Japanese? A: Yes it was printed up and bound. It was called, "Crossing the line" and based on kumite tactics for competition. Using body mechanics and angles. So I'd worked on this and worked on all the Shotokan kata and bunkai. My name is called and I go out. Nijushiho. There I am looking at the panel remembering all the competitions I've done, remembering all the gradings I've taken, and thinking, ok here we go. I'd done Nijushiho for Asai Sensei for my godan so felt very comfortable with it but a bit on edge after Kagawa Sensei's dissection the previous evening. Once I got started I was happy, like putting on a pair of old shoes. I felt good doing it and knew I had followed Kagawa Sensei's points that he'd given me. On every angle in the kata I could see a face looking at me. When I do kata I don't do it to look good, I do it to fight. So my eye contact was with everyone watching, the grading panel, and the pack of wolves that were padding up and pacing in the corner. It was all about, "I'm not here to fall down in front of anyone". So I enjoyed my kata. After Nijushiho I was kept on the floor. I thought I'd be doing bunkai now. Instead Kagawa Sensei said "another kata". I thought ok, maybe Hangetsu, Kankudai or something like that. But no, "Sochin". Kagawa Sensei's favourite kata! Another little, "here's something for you, measure up". And he's sat there with his passive look but I thought fine! Alan Campbell (standing right) has his theory test translated for the grading panel. Q: This is what you wanted isn't it? A: Yes. I thought fine, lets have it. Now previously I had been working a little with a JKS England student, who didn't get his sandan because of a problem with Sochin. We had worked hard on the start because you know from the opening moves if a kata is going to go well. By the time I got to the tate shuto on the second move I knew it was good. So when I finished I looked at the panel and thought, "you can have this". It was possibly the best experience I've had doing Sochin ever. After I'd finished I was told to go and sit down. However I knew something else was coming! The other two guys got called to kumite and they were good. So although it had been mentioned that kumite would not be on the menu for me, I knew full well that the starter was kata and the main course was going to be kumite! And so it was, the first fight was with the South American. Good fighter, tough, he caught me with a solid punch but I was in no mood for letting anything stop me! My reach was working well for me and a lot of jodan Tsuki's landed! Afterwards I was happy with the fight. This was typical grading kumite. Kanayama Sensei was the "referee" but might as well have not been there. So anyway one fight down and all good. The second was straight after (no recovery time!) with Kai, a Kenshusei (trainee instructor) and ex Teikyo University Captain. He's young and incredibly quick. As a Kenshusei he had to prove himself too. He couldn't lose face against me. So he has to come in hard. In a way he is being tested as much as me. So it was absolutely no quarter given and none asked for. It's absolutely what I wanted. It was very full on and we were all over the place! The fight went to ground a few times which was pretty cool, it's great to be involved in a fight like that, it's very exciting and the adrenaline is pumping hard, yame was only called once and that was only at the end. Q: So that's two fights? A: Yes I thought, "Well that's probably me done now". I didn't think I had much left. I'd done a hard session with Kanayama Sensei, done two intense Kata and two hard fights. But next up from the waiting pack of wolves was Makita Sensei, who is probably the quickest person I've ever seen. He is All Japan Kumite Champion. So it was back to work again! We had a good fight and again, no yame called until it was over. When we finished I thought "that really is it now". And it was to an extent, but I hadn't reckoned on the Kumite report, which was, shall we say, very well examined. It was scrutinised bit by bit by the five man panel of examiners. I made a slight error early on by attempting a joke about a point in the thesis which did not go down very well. Lots of questions were asked and it went on for what seemed like forever! Actually, really it was about twenty minutes, but it just felt they were like a dog not letting go of a bone. So I had to demonstrate moves and tactics on an opponent. This, of course is fine, but a little more difficult when tired. I was thinking "what more do you want?" I was standing there with blood coming down me, just a cut on my arm, but still, I was bloody and battered and extremely tired. I did think that "maybe they are not going to let this go". So I was really right on edge. And then it was over and I didn't think I'd passed. Not because of my kata or kumite, I was very happy with them, but because of the massive scrutiny they had given my report. So I thought I'd failed, probably just how they wanted it. Q: That is a very common feeling after people take gradings, thinking, Oh! I've failed. A: And that's exactly the feeling you need. This is the whole point. You feel well and truly tested. It's very harsh, you're thousands of miles from home, you can't get a refund on your air ticket. But you're there, not just in Japan, but at the centre of a world wide organisation under the watchful eye of one of the world's greatest Karate masters. And if you fail, they will have no remorse whatsoever, they will expect you to come back and do it again. They will be training again tomorrow and will expect the same from you. I don't understand people who fail a grading and think, right I'm leaving. Q: Well I am sure readers will have seen people fail fourth dan with one group only to move to another and be given fourth dan or even fifth! So they call line up and? A: They line us up. I was the first name called. And it's "pass Rokudan". After that I'm afraid I missed everyone else's result! Q: You told me before you went that you were determined no matter what happened, to have a good time in Japan and that failing would not have ruined the trip. That's not true is it? A: No if I'd failed I would have had a terrible time. Kata Sochin was Alan's second kata. Q: So looking back on it what would you say to people who say you don't need to go to Japan? A: I'd wholeheartedly disagree with them. If you train properly in Japan for any length of time, a year a month even a week, you realise what the experience is. Obviously it has to be at the highest level, with world class instructors, you are aspiring to be like. You just see the intensity of training. The repetition of techniques (which some people criticize but which breeds such uniform precision). I remember when Scott Langley first came back from Japan back in 2003 and we did tube training for the first time. No one really knew what to expect. But watching Scott, after about half an hour he was the only one in the dojo who kept his technique. Everyone else was struggling, leaning into or pushing the tubes etc. Q: I remember that session because I threw up! It was a revelation, we still do it now in your morning sessions and it's still a challenge. Any weakness is exposed. A: It's a fantastic training aid. Tube training is very pure. You have to beat the tube right from the start of the technique. So if you have done your repetitions and developed your technique the tube is not so hard because you are using pure technique. It requires you to use all the links in your body to punch or kick. Q: Since you have come back I've noticed you're still training hard. Still doing the mornings. A: Yes morning training is something I took from Scott really. When you are teaching a lot you still need to train and morning training lets me do that. My students who join me know they won't be taught as such. It's not a class it's training. Everyone counts, we usually do tubes, slow kicking with weights or kihon then kata then finish and off for breakfast. It's just solid hard training. Not easy, not for everyone. Training at seven thirty in the morning is a challenge. Q: So you're back from Japan, passed 6th Dan, not awarded, passed. But training goes on? A: Yes of course it has to, we are doing this interview after morning training. But I have to say that grading in Japan was an amazing feeling. I was elated, the most I've ever been in all my times in Karate and at my age that's something! I thought I would never have that feeling again. It's that youthful thing, like when you win a championship; get a trophy and a real high. For days after I was grinning from ear to ear. Q: A brilliant Christmas present? A: A brilliant Christmas present. But! Reasonably soon after it was back to it. No massive fuss. It was something I needed to do and I did it!